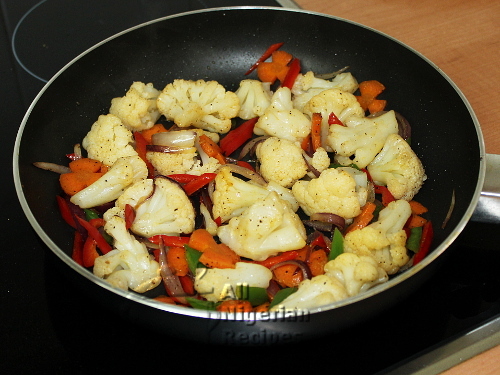 Cauliflower Stir-fry makes a great side dish to Grilled Chicken, Nigerian rice dishes, Fried Plantain and Nigerian Moi Moi. It is also a nice light meal on its own. You can have it when you need a light lunch or dinner. Very healthy! 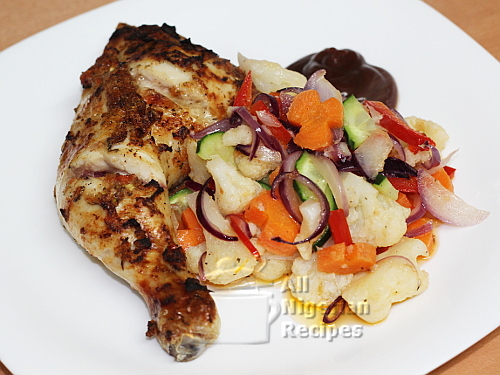 This meal is just vegetables and is quite filling on its own hence makes a great weight loss meal. 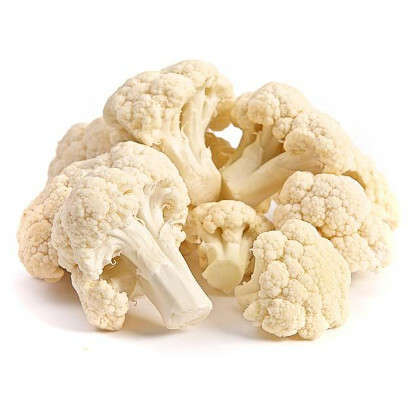 Feel free to change the quantities of ingredients to suit the look and taste you want for your own Cauliflower Stir-fry. 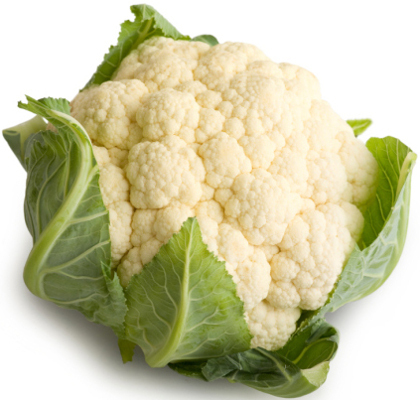 Cauliflower is a variety of cabbage that has a bunch of many undeveloped flower buds. It can be purchased from all major supermarkets all over the world. In Nigeria, look for it at Shoprite and SPAR. The seasoning cube is just for taste and is optional. If you will eat the Cauliflower Stir-fry on its own, it is important that you add some kind of seasonin to it, else it will be tasteless. You only need a very tiny quantity, about one quarter of a small cube. If you will eat it as a side dish to another seasoned meal, skip the seasoning cibes because the Cauliflower Stir-fry will get some taste from the seasoned meal. Use tasteless and odourless vegetable oil for frying: sunflower oil, canola oil or the vegetable oils sold in Nigeria. 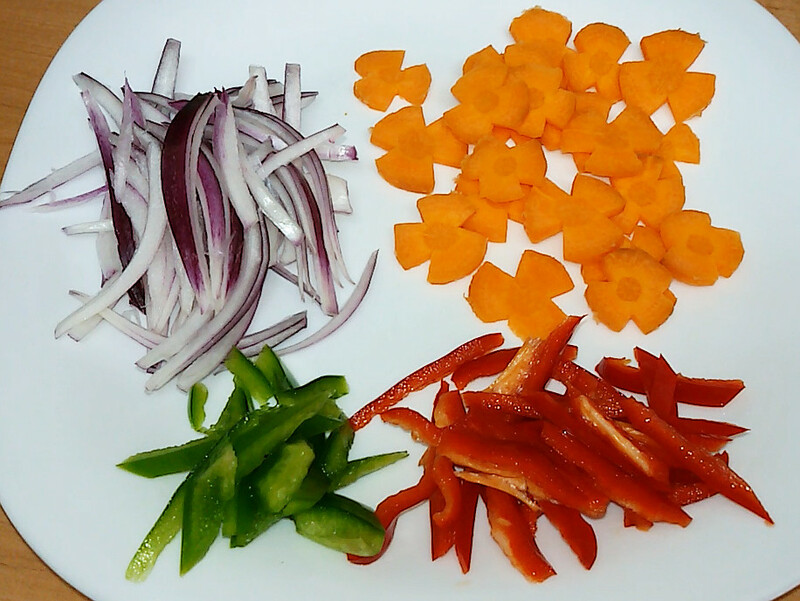 Rinse and cut up the vegetables any how you want them. Rinse and cut the bunch of cauliflower into florets. Pour a small quantity of water into a pot and let it boil. This is a very small amount of water that will dry up by the time the vegetables are cooked. See the video below. Once it boils, add the cauliflower florets and cook for about 2 minutes or till it is soft to your liking. Some people like it crunchy. Stir from time to time so they will be evenly cooked. When you are happy, add some salt, stir and take them off the pot and set aside. Add the pieces of carrots into the same water in the pot. Cook on high heat till all the water dries up. In a frying pan or wok, add the vegetable oil. Once it heats up, add the onions and fry for a bit. Add the carrots, fry till the first signs of browning appear. Add the peppers, fry for a bit then add the seasoning cube (crushed) and black pepper. Add the cauliflower florets and stir till you notice some browning. Add salt if necessary and that's it! Cauliflower Stir-fry is a meal in its own right but you can serve it with Grilled Chicken, Nigerian Rice Dishes, Boiled Yam, Fried Plantains or Nigerian Moi Moi.